I saw that Install articles are wanted, and I just finished installing my sound system, so I thought I would show you all how I did it. This is my first install thread ever, so I hope I took enough pictures . Let me know if you have any questions or need any help. 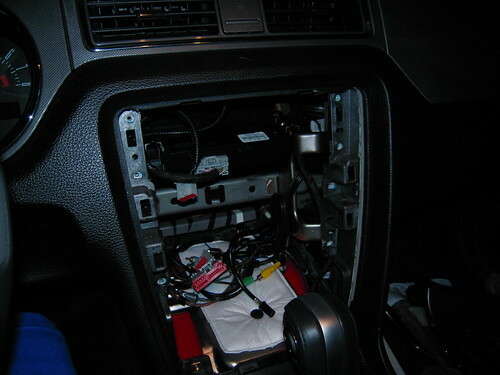 Second: I had already installed my 4 speakers, 2 amps, and subwoofer in the trunk. I will upload what pictures I have of those as well if anyone wants to see what I did for those. I have 2 Focal Component speakers in the doors, and 2 in the rear deck with 2 JL audio subs, one for the speakers, one for the JL W3 12" subwoofer. I built a custom box for the sub and it is in the trunk on the passenger side behind the wheel well. I ran all the connections up front to the radio but I didn't have the metra kit yet so I didnt install them. Third: I had the steering wheel control and wiring harness and the head unit so I had previously connected all the wires as directed. The instructions are straight forward and they tell you to connect the colored wires to the correct wires from the aftermarket radio wires. Both have some sort of labeling system for the wires, either on the wires or on an included instruction sheet. 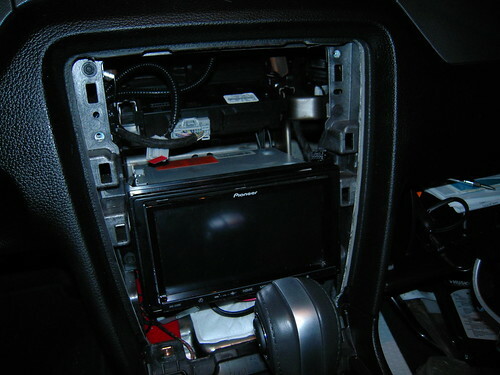 Fourth: I finally got the Metra kit, and I saw the request for Installs so I decided to document the last portion of my stereo install. 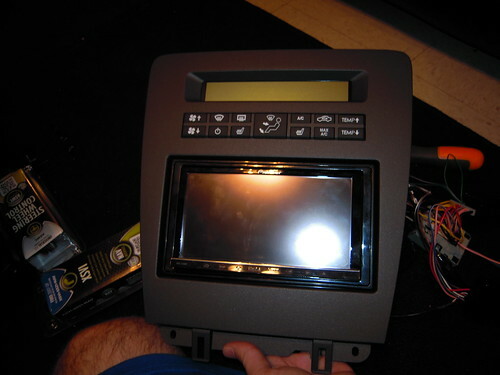 Parts in the metra kit had the parts for both single and double DIN radios, but it requires modification for the double din. 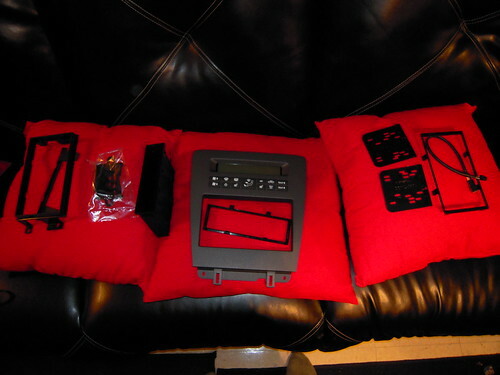 Here is a picture of all the parts included in the Metra Kit. I used some pliers to cut the piece, then I used a knife to shave down the excess to make it smooth. Then you put these pieces on the main mounting piece. 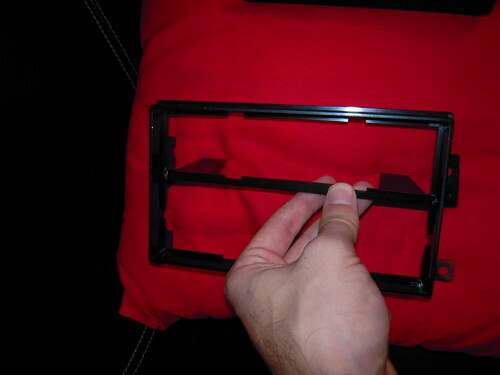 There is a trim piece that came with the kit to cover the gap. Looks pretty good. Also I would put the HU as far out from the mounting as possible, that way it is closer to you in the car. The cable included just plugs into the faceplate and the wire behind the original faceplate. My stock radio, no SYNC or nav... Yet. and yes, it is an Auto, don't hate. 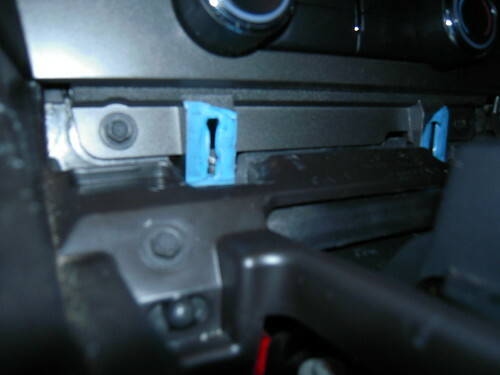 To get to the radio screws you need to first remove this trim panel. 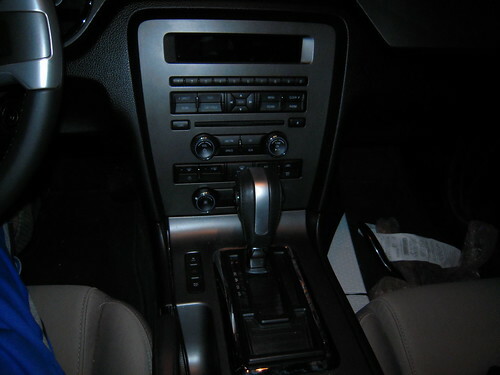 Then you just pull up on the center console. I start from the back by the storage area and work my way forward. 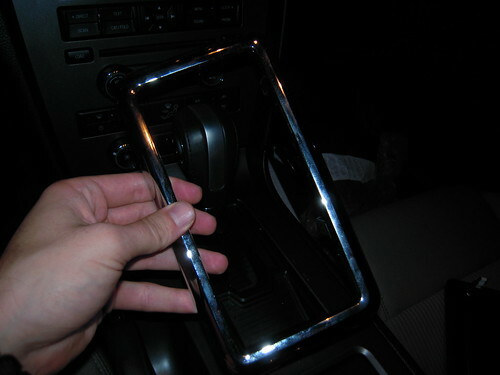 If you have an automatic like me you need to either pull it out of park or twist the panel like shown. 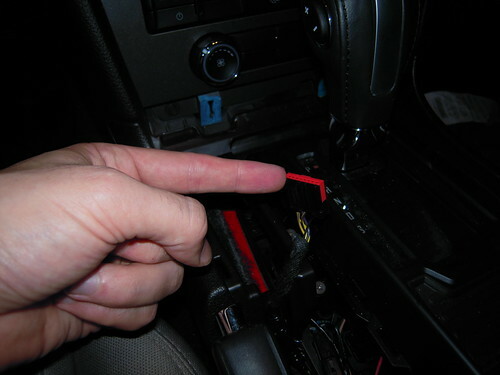 you should twist it 90 degrees then rotate it vertical and it should come off after you unplug the trunk/hazard/TC buttons. Dont forget to plug it back in when you put it back together. I did that and my hazards just turned on once the key was in. 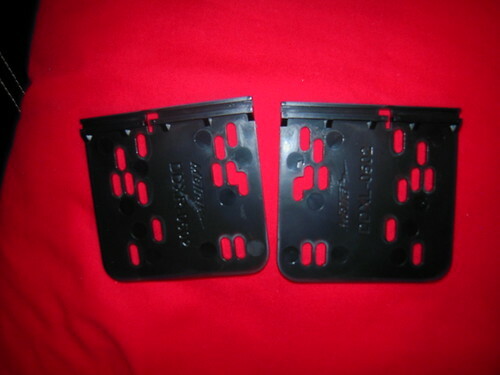 Then there are two screws on the bottom of the stock faceplate. I used a 7mm socket for all the screws for the radio. The faceplate just pulls off, it is tough to grip, but doable. 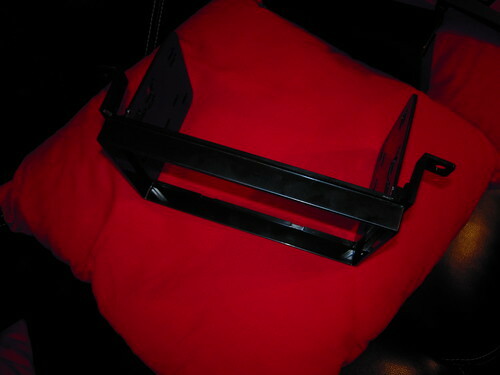 Here is a pic of what to expect with the faceplate removed. 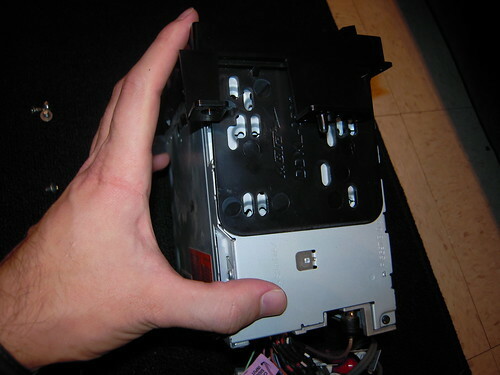 There are 4 screws on the radio part, and 4 more on the display part. BE CAREFUL WITH THE SCREWS! I lost 2 because they fell somewhere into the center console and they disappeared into a black hole of doom... aka I can't find them but good thing is that I don't need them with this kit. The METRA instructions don't mention this, but you need to take out both the radio and the display LCD screen in order for the METRA kit to fit. I wasn't surprised, but they could have done better. Again, DON'T DROP THE SCREWS! Here is everything taken out, and my amp wires are all sitting there nicely. I put my radio in after carefully making sure to hook everything up correctly. 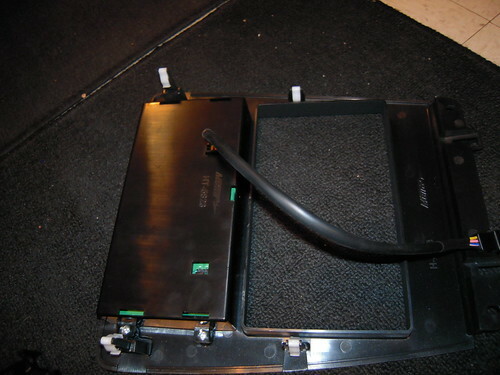 With the wiring harness it is plug and play once the radio is connected to the harness. With this radio I had to worry about the GPS antenna, the steering wheel plug(looks like a headphone jack), and the microphone for the Bluetooth phone interface. 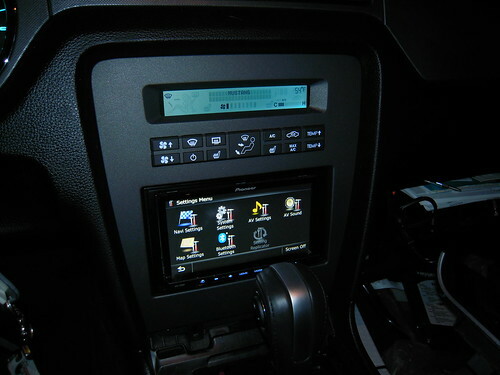 I ran the GPS all the way to the rear deck and I installed that with everything else in the sound system. The microphone is next to the drivers head on the A-pillar. It is easily changeable, but I picked this spot because other spots I have tried in the past seemed to have a lot of road noise. If this is loud to whoever I'm talking to I will move it to the light panel on the ceiling. Since I didn't want to lose any more screws I re-installed my extras into their original holes by where the display panel was. 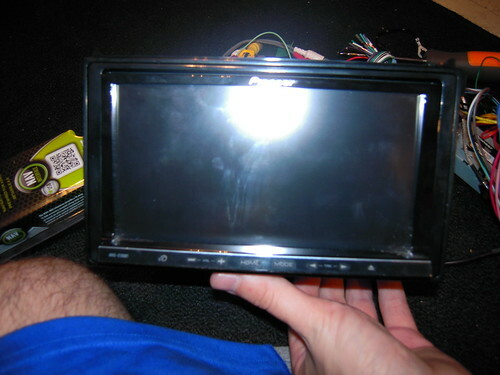 Also as you can see in this picture the reason why the HU isn't further up the dash is the mounting bar for some electronic piece is in the way. 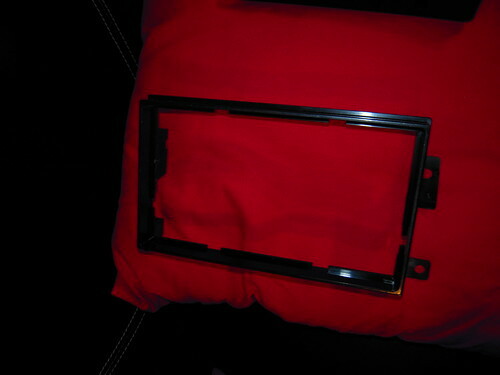 If that is removed then you could mount the HU higher, I have heard of it done, but I haven't done it because I don't want to fabricate a new face plate. Here is the pic. 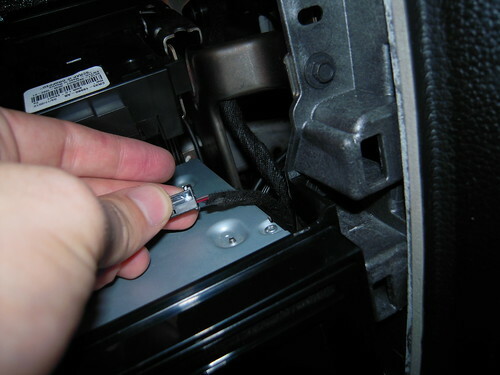 Also be sure to bring the original connector to the top of the radio so you can hook up the new face plate. After that is all done, just plug the head unit in, screw it in on the bottom like the stock one, and put everything back together. It is a really simple install once have all the pieces. 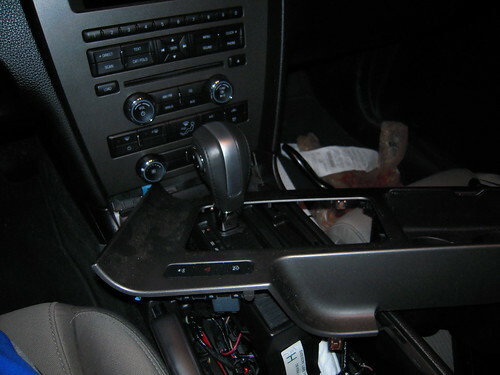 I ran an Ipod cord to the glove box as well and that Ipod just stays in the car now because it gets charged through the radio. Hope that helps someone, and like I said let me know if I can help you with your radio. I will try and get another post up regarding the rest of my system install, but since I don't want to take my car apart again it might be a while. I will write up what I did if someone asks, but since there are other threads on the topic I am not too worried about it. Last edited by ticopowell; 11-15-2012 at 08:31 PM.